on August 7, 2018, 8:42 a.m. This month, Birell is the brand which has achieved the biggest uplift in its Ad Awareness in Egypt. The country saw its national team qualify for the FIFA World Cup, therefore it was well placed to capitalise on some football themed product marketing. 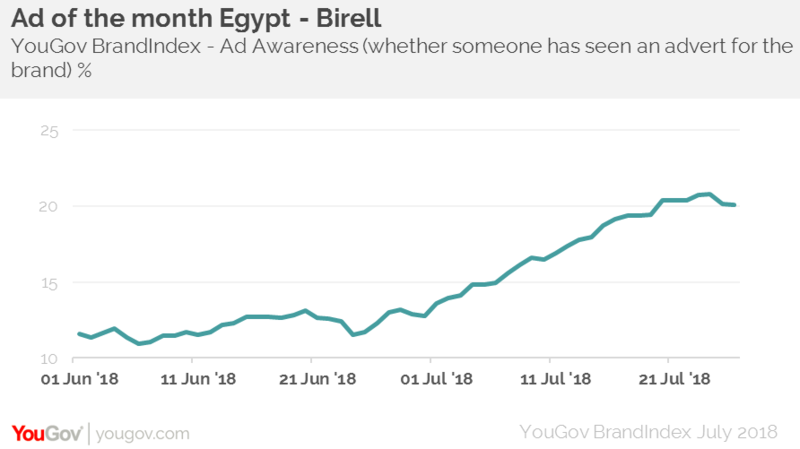 YouGov BrandIndex data shows that as a result of its football oriented ad campaign, Birell’s Ad Awareness score (whether someone has seen an advert for the brand) has risen significantly from +12 to +21 since the World Cup began. The campaign has achieved significant cut through among those who would already consider buying from the brand. Ad Awareness among this group has gone from +36 to +59. Not only is the campaign being noticed, but it’s also causing conversation. Birell’s Word of Mouth score (whether someone has talked about a brand with friends or family) has gone from +10 to +16. Birell can be pleased that the World Cup has had a great impact on its campaign efforts, and it will be looking to harness this recent success and continue it throughout the coming months.